The doors closed behind Oscar Mayes, stopping him in his tracks. Everything came to a halt and he was alone with his thoughts. He tracked back to the awful mistake that landed him in a detention center in Clayton County, Georgia. For the 15-year-old Mayes, it didn't matter whether he looked backward or forward. He was haunted as much by the future as by the past. When was his court appointment? Where would he be transferred next? When would he see his family again? Life's certainties hung by a thread. The prospect of hard prison time loomed in his mind, knocking off future milestones one by one. Before the System of Care, the young residents of Jonesboro, Forest Park, and towns across Clayton County could easily get caught up in the juvenile justice system. Georgia's legal code was exceptionally rigid: by committing any one of 31-plus crimes, an offender became a "designated felon," regardless of whether he was 53 or 13. The district posted police officers at its schools. Cops began arresting kids in large numbers for soft offenses—fighting, mouthing off, causing a disturbance. The strategy ended up flooding the county's juvenile justice system, with one probation officer's caseload ballooning to 110 students. Steve Teske, a longtime county resident and chief judge of its juvenile court, was most alarmed by the overcrowded rooms at the detention center. The 100 detainees there outnumbered the available beds, leaving 40 or more teens to sleep on the floor—a sobering picture of where zero tolerance can lead a community. The story changed when Mayes and Teske met. During what should have been a routine hearing in which Teske had been prepared to reduce a possible sentence of 25 years to a mere 5, the judge paused a moment to consider the magnitude of five years—and the future prospects of the young individual about to serve that sentence. "When I saw Oscar brought in and heard him speak . . . how smart and intelligent, how articulate he was," Teske remembers. "I was looking at someone who could do something great in his future. I also knew if I sent him to prison, I'd knock him off the road to success." Any pipeline needs release valves, and in the case of this particular pipeline running from school to prison, the deep-end valve was definitely missing. That was the sticking point for Teske and the other System of Care architects. At the very least, there ought to be a release valve for a young man like Mayes that could help save him from an awful fate—the same one that awaits so many young men of color, men who spend the prime of their lives behind bars. Back in 2003, Teske had met with the school district superintendent, police commissioner, and other county administrators to map out a county-wide system that included multiple release valves at the front end of the school-to-prison pipeline. The new approach reduced school arrests by 83 percent and sparked the creation of a school-focused System of Care that brought together school staff, students, students' families, and community resources to target the core factors of disruptive behavior. For youth in trouble, harsh punishment was no longer the first and only resort. System of Care interim administrator Sheryl Teske explains that the system was developed to optimize what many youth-focused practitioners were already doing. 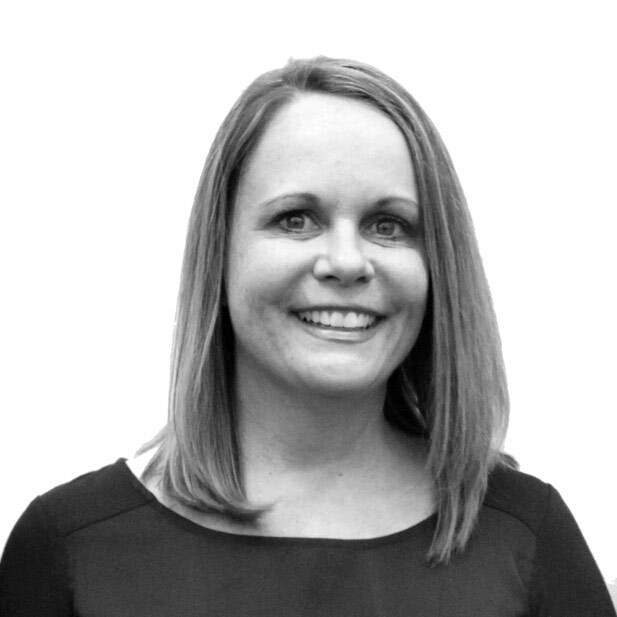 "We needed to put it all under one umbrella organization with a backbone agency pushing the mission and putting the processes together." The shared game plan for the county's youth soon found its mission as well as its mission statement: "In school, out of court, and on to a positive and healthy future." The shared game plan for the county's youth soon found its mission as well as its mission statement: "In school, out of court, and on to a positive and healthy future." The System of Care was a meaningful start to a coordinated response, but Mayes's case made clear how essential that deep-end valve was for youth about to enter the justice system. And thus was born Teske's vision for a Second Chance Court. Today, the court serves as a bypass of the one- to five-year prison sentence mandated for designated felons. It's not an "easy out" but instead requires participants to make a firm and lasting commitment. Finishing the program means going through home confinement, wearing a GPS ankle bracelet, and completing regular drug tests. Participants also sign up for a personal plan that includes individual and group therapy and life-skills courses. One popular course is Thinking for a Change (T4C). Instructors describe it as a cognitive behavioral change program "targeting the criminogenic needs" of offenders. Or, as graduates like Mayes, now 20, and Leandra Phommavongsay, 19, describe it, T4C replaces "straight-reaction" habits with self-discipline and control. What does that mean in terms of personal growth? Phommavongsay explains: "Now, I think before I act, I think before I speak, I think before I move." The release valve that has benefited Oscar Mayes and his peers is just one of many. A constellation of professionals working for the county continuously work out success plans, and those plans are customized for each student referred to the System of Care. A key trait of the system is its close integration with the district's schools. These days it is more likely for a student to be targeted for an urgent intervention than it is for that student to develop a rap sheet. Mental health services are a top priority, and school counselors, coordinating closely with private mental health agencies, work alongside students to help them through personal issues at school and at home. Parents and guardians are enlisted as core supporters in their kids' plans, with a strong focus on equipping them with the tools to engage successfully with their children. Another pivotal actor in the System of Care is the community nonprofit. A partner like Tips 4 Teens, which primarily serves Clayton County middle school students, offers tutoring, mentoring, and enrichment activities. Instruction covers everything from the practical, such as how to wear a tie, to the indispensable, such as how to peacefully resolve a conflict. For Sara Hammock, grandmother of 12-year-old Kianu, Tips 4 Teens fills an essential need, particularly in a household missing a father. "In the last six months, [Kianu's] made a 180-degree turnaround," Hammock says. "According to his teachers, he's a different person. . . . And the fact that he has two men [at Tips 4 Teens] that mentor him, I see a big change in his attitude in general." 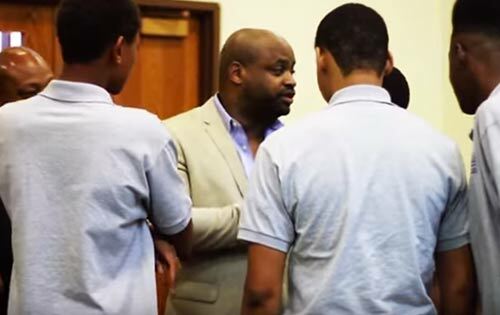 Another program, the Young CEO Institute, serves a slightly older population, with a special focus on building entrepreneurship skills in young African-American men. "We look at their lives and what they aspire to be," says Program Director Jevon Gibson, "and then we offer them tangible, practical ways of becoming employable . . . but also within the context of the history of the African-American community and communities of color." Gibson's class calls for on-the-spot thinking and confident, assertive responses to his questions. ("From the gut!" he prods quieter students.) Through role playing, the class thinks through the pragmatic, everyday challenges of being an entrepreneur. You've been given control of a family business, starting today. You need to form a staff. Who are you going to hire? The message is explicit: You are in the driver's seat, and the hard work of pursuing your dreams starts now, if it hasn't started already. By pushing this collective approach to youth in trouble, Clayton County has stemmed the tide of young offenders crash-landing in courts and the juvenile justice system. The county has reduced detention rates by 70 percent since 2003, with the numbers of detained youth of color down 56 percent. The current daily population at the detention center—once averaging 100 and now at 12.4—actually has Judge Teske wondering how much longer he'll be needed. What's more, the program's cost savings are significant: compare the $90,000 a year it costs to house one kid in a youth prison to the $74,900 a year it costs to run the entire Second Chance program. Over a four-year period, the county has saved $4 million, of which a part has been reinvested in its youth programs. Together, these numbers have convinced the Georgia Assembly to write a new legal code for youth and model it directly on the Clayton County approach. The System of Care has won the dollars-and-cents argument. But there's a less tangible but equally significant win here. You can hear it in a boy's reflections on a favorite class and the comfort he's found in mentors he trusts. "Participating in the Young CEOs for me is like having my father here with me," says Khalil Harriot, 13. "It fills in that hole in my heart that kind of replaces him, puts him in that place." A Young CEOs class closes with the students gathered in a circle to recite an inspiring quote. It's a final moment of self-affirmation. Jevon Gibson makes sure they stand shoulder to shoulder. The reading has a rocky start, the young men on different beats, their words jumbled. One of them calls for a restart. "All right, y'all. On three." They begin again, this time their voices synched in a tight cadence that pushes them forward. What is one important thing you learned from building partnerships with the schools? Partnering with our schools also means working collaboratively to bridge gaps between vulnerable Clayton County youth who attend those schools and the community services they need to be successful in addition to reducing arrests. 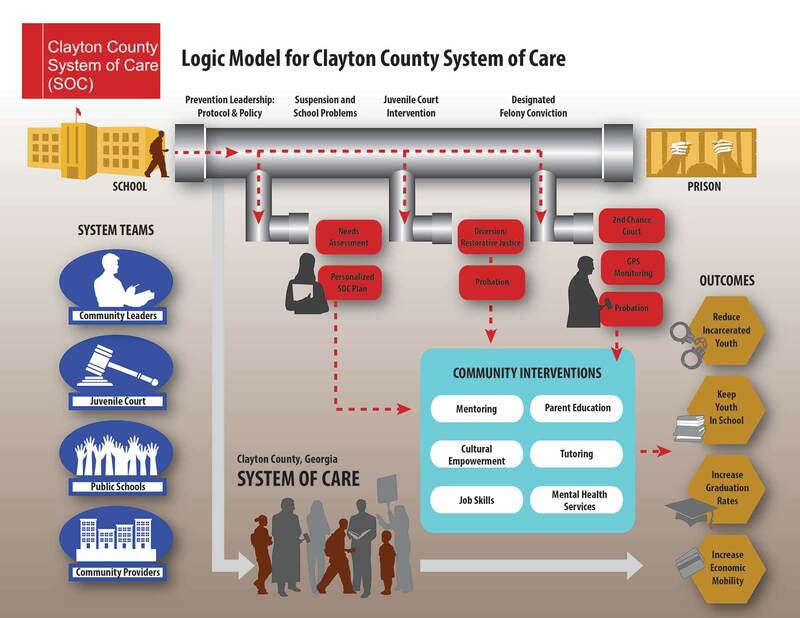 How does the Clayton County System of Care involve parents of the youth in its mission? Our mission is "in school, out of court, on to a positive and healthy future," which essentially embodies the creation of a cradle-to-career pipeline for success for our most vulnerable youth. This includes supports for parents/families of Clayton County youth as well as opportunities to serve on the Governance Committee, the Advisory Board, or in a volunteer capacity to give voice to a youth agenda supportive to the mission. How have you seen the model of the System of Care influence other juvenile court systems in your region? Clayton County's support of Juvenile Detention Alternatives Initiative efforts, with assistance from of the Annie E. Casey Foundation in 2002, resulted in a school referral reduction protocol (SRRP), which is the foundation of our current work. The SRRP laid a foundation for a School/Juvenile Justice/Law Enforcement partnership. This protocol has reduced court referrals from Clayton County Public Schools by 83 percent. It was the first of its kind in the nation, and our technical assistance team has assisted in duplicating these efforts in over 15 sites, serving 35 jurisdictions nationally, with additional requests pending, including Chatham County, Georgia. This collaborative partnership was further supported by the addition of community-based panels for alternatives to detention, restorative programming for youth already involved in the deep-end of the juvenile justice system, and the creation of a System of Care approach to bridge the gaps between vulnerable youth in our schools and the community services they needed. This model has become the Clayton County System of Care. These efforts became the centerpiece for changes made to Georgia's Juvenile Justice Code and programming from these efforts became a statewide model for juvenile justice reform.